People calling in unexpectedly over Christmas need not fill you with dread if you have a few tasty snacks stashed away in the freezer. It’s lovely (usually!) to have people pop in to wish you a Merry Christmas, but it’s even more special if you can offer round something delicious to enjoy with a glass of mulled wine or sherry. Of course, people don’t tend to call in at mealtimes without letting you know, but it can end up that you’re all having a good time and you want to offer something more substantial than a snack. It may sound a little over the top, but in the weeks before Christmas, how about making a big (or two small, depending on the size of your family!) lasagne (meat or veggie) or cottage pie and putting it straight in the freezer, uncooked. That way, you’ll be able to extend the hospitality, knowing that you just have to put it into the oven. It’s worth having a couple of garlic baguettes and bags of peas in there too. Even if you don’t end up eating it over Christmas, you can either enjoy it for a New Year’s supper, or simply keep it in the freezer. It’s fine to simply put nuts and crisps in bowls if you have guests pop in unexpectedly, but just think what a domestic goddess you’ll feel when you pass round a tray of delicious home-made snacks instead? This is another time to make good use of your freezer, as so many little tasty treats can be quickly heated from frozen in a hot oven. Rather than buying sausage rolls, they’re really easy to make if you buy good quality sausages or sausage meat and ready-made flaky pastry. Mince pies are also really easy to make when you buy excellent ready made ingredients – just add a dash of whiskey to the mincemeat and it’ll be all your own work! A more unusual idea is to make a savoury choux pastry mix. Instead of adding sugar, add in plenty of grated parmesan when you add the flour and plop little balls of mixture onto a baking sheet and open-freeze - they cook straight from frozen and are great with drinks. If you don’t fancy turning the oven on, you can simply make sure that you have a cupboard full of unusual snacks that will please your guests and save you getting frazzled. Choose vacuum-packed marinated olives, cubes of manchego cheese and a little pot of quince paste for a tapas vibe - perfect with chilled sherry! Or go for fiery-hot wasabi peas and Japanese rice crackers – delicious with a lychee belini, just pour a measure of lychee liqueur in the bottom of a champagne flute and top with chilled cava or prosecco. 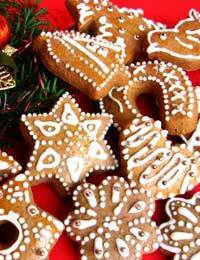 Home-made biscuits are a perfect Christmas treat for unexpected guests. Try making a batch of gingerbread and topping it with a cinnamon icing – it tastes really Christmassy and lasts for a good few days in an air tight tin. Don’t fret about cutting your Christmas cake early if you have unexpected guests. Although it’s lovely to ‘keep’ it for Christmas Day, most people are too full from lunch to enjoy it and your guests will appreciate it. Check out our ideas for tasty canapés at Christmas.